*Cash equivalent in the form of a check. **NO PURCHASE OR PAYMENT OF ANY KIND NECESSARY TO ENTER OR WIN. PURCHASE WILL NOT INCREASE YOUR CHANCE OF WINNING. Open only to legal residents of the United States residing in the 50 United States or District of Columbia, 18 years of age or older at time of entry. Void where prohibited. 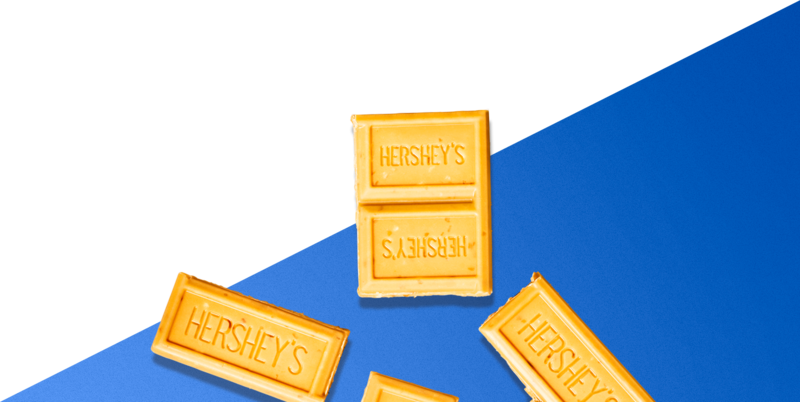 Promotion Entry Period starts at 12:00:01 AM ET on 12/14/18 and ends at 11:59:59 PM ET on 07/31/19 or when the supply of specially marked HERSHEY’S GOLD candy bar codes has been exhausted, whichever occurs first. Redemption period ends at 11:59:59 PM ET on 08/31/19. 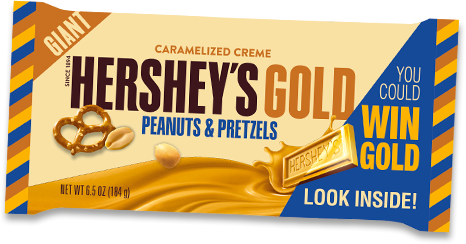 TO ENTER: Look for a code inside specially-marked packages of HERSHEY’S GOLD candy bars (standard 1.4 oz., king 2.5 oz., or giant 6.5 oz. sizes) available at participating retailers (giant 6.5 oz. available at participating Walmart stores only). 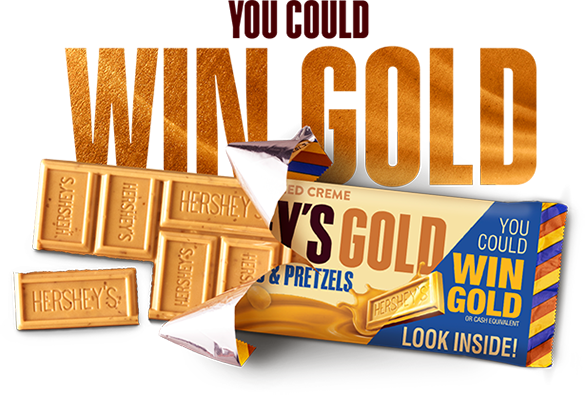 OR TO ENTER WITHOUT A PURCHASE, hand-print your name, complete address, and age on a self-addressed stamped envelope and mail in a first-class stamped envelope postmarked no later than 07/31/19 to be received by 08/10/19 to: Hershey Gold Rush Game Request, P.O. Box 251328, West Bloomfield, MI 48325. Limit one free entry per stamped outer envelope. PRIZES: Grand Prize consists of a 6.5 ounce 24K Gold Bar (or cash equivalent). Approximate retail value (ARV): $7,181. First Prize consists of a 2.5 ounce 24K Gold Bar (or cash equivalent). ARV: $2,762. Second Prize consists of a 1.4 ounce 24K Gold Bar (or cash equivalent). ARV $1,547. Odds of winning a prize: 1:130,000. ARVs are based on value of spot gold as of 8/10/18 at 8:32 AM ET and actual value of gold bar is subject to gold value fluctuation at date of award. Cash equivalent value is based on stated ARV for applicable prize. Limit one prize per name/address/household. Click here for Official Rules for other details. 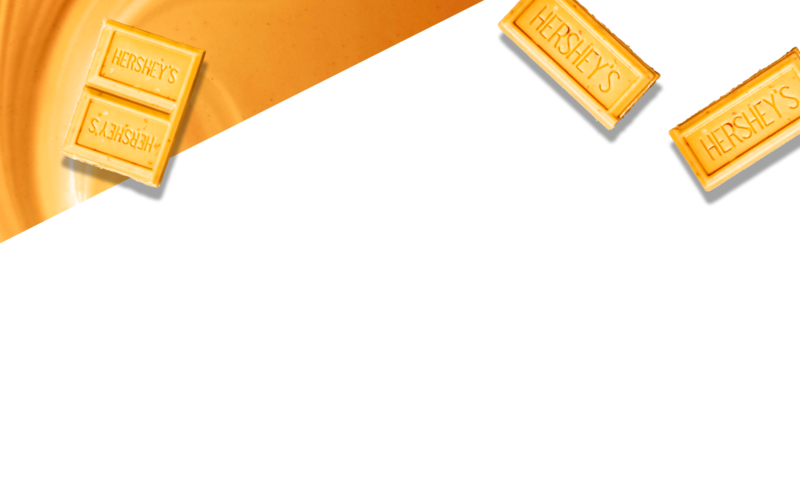 Sponsor: The Hershey Company.